Burns Bog is one of only two remaining habitats for Sandhill Cranes in the Lower Mainland. The Bog is threatened by the development of the South Fraser Perimeter Road, located beside the staging habitat of these magnificent creatures. Burns Bog must be protected. Make your voice heard. Get involved! Create your own origami crane and send it to Burns Bog Conservation Society. Write your name along with a message on the crane;s wings about why you want Burns Bog protected. The cranes will be gathered and sent to the Premiers' Office along with petitions and letters against the South Fraser Perimeter Road. 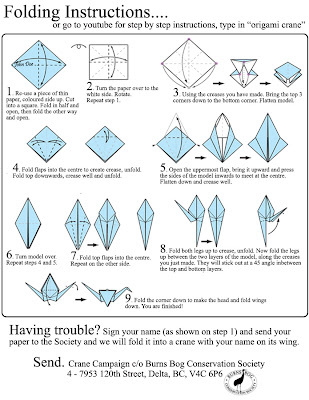 Click on the image below for instructions on how to make your crane, and for mailing directions.